A better way to manage your Pine River State Bank card is just a tap away. Introducing My Mobile Money Access, a new app offered by Pine River State Bank to help you control and monitor card usage anywhere, anytime using your mobile phone. With My Mobile Money Access you can protect your card from fraud by setting alerts and controls to determine how your card can be used. And, if you misplace your card, you can use the app to turn it off . . . and then turn it back on when you find it! app today to manage account alerts and monitoring anytime, anywhere! Our Debit Card can be used to make purchases. Debit cards are accepted more places than checks. Cards can be issued to each authorized signer on your business account for a flat fee of $1.25 per month. When a transaction is being processed through a foreign country, your card will only work if the card is physically swiped at the time of the transaction. 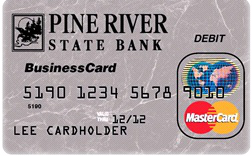 Looking to Apply for your Pine River State Bank MasterCard Debit Card? Click below to print an Application. Subject to Approval.